The Warriors face Franklin & Marshall on Saturday at 12 p.m.
WILLIAMSPORT, Pa. - After clinching a spot in the Centennial-MAC Bowl Series with a tough 21-14 win over Misericordia, who was battling for a share of the conference title, the Lycoming College football team will get its first taste of postseason play in 11 years, as it faces Franklin & Marshall College in the bowl series on Saturday, Nov. 17, at 12 p.m. The Warriors (5-5 overall) feature the third-lowest scoring defense (20.1) in the MAC and the team leads the league in interceptions (17). The Diplomats (7-3 overall) are led by senior quarterback Tanner Erisman, who has 17 touchdowns against seven interceptions this season. • Lycoming five First Team All-MAC picks were the most for the team since 2011. • The Warriors lead Division III with a 0.11 defensive fourth down conversion percentage. • Lycoming leads the MAC with 17 passes intercepted, which is 11th-best in Division III. Both senior Joe Pinzka and junior Jeff Coplin are second in the league with four picks. • Junior Jamie Fisher is one field goal shy of becoming the third player in school history to hit 25 in a career. He is the only player to hit 10 in back-to-back seasons. • Freshman Elijah Shemory is 81 yards shy of becoming the 16th player in school history to pass for 2,000 in a season. • Freshman Matt Stankiewicz needs three more tackles to become the first freshman since Tanner Troutman had 53 in 2012 to post 50 tackles in a season. Seven Warriors earned All-MAC honors, including five first-team selections, the conference office announced on Tuesday. Senior wide receiver Nick Costello, senior offensive lineman Brad Stubbs, junior kicker Jamie Fisher, senior defensive lineman Ahmad Curtis and senior safety Joe Pinzka were the first-team selections, the school's most since the 2011 team also had five first-team picks. Senior defensive lineman Sam Romanofsky and senior special teams player Mike Mulvihill were second-team picks. Although the Warriors' streak of eight games without giving up a fourth-down conversion ended against Stevenson, the Warriors still lead Division III with an 11 percent fourth-down defensive conversion rate. Lycoming has allowed just two first downs in 19 opportunities this year on fourth down, which has included three stops inside the 10-yard line. Although freshman Elijah Shemory has tossed for 12 touchdowns, he has also done a remarkable job finding the endzone with his feet, rushing for eight touchdowns, all on quarterback sneaks. He snuck into the endzone twice during the team's game against King's on Sept. 29. It was the first time a Warrior quarterback scored twice in a game in seven years, since Zach Klinger dove in three times in the 2011 season finale against FDU-Florham, a 54-7 win. He did it again against Stevenson on Nov. 3, rushing into the endzone from one-yard out twice. Shemory has eight rushing touchdowns this season, the most times a Warrior quarterback has found the endzone since Zach Klinger also posted eight in 2011. It is tied for second in program history for a Warrior QB, behind only Larry Barretta's 10 rushing touchdowns in 1984. The Centennial Conference and the Middle Atlantic Conference (MAC) announced on Nov. 5, 2015 their partnership to hold two postseason football games between member institutions. In the spring of 2018, the two conferences approved an additional bowl game to increase the series to three games. This season (2018), the Centennial Conference (teams) will host the No. 1 seed (Stevenson at Susquehanna) and No. 3 seed (Lycoming at Franklin & Marshall) games, while the MAC (team) will host the No. 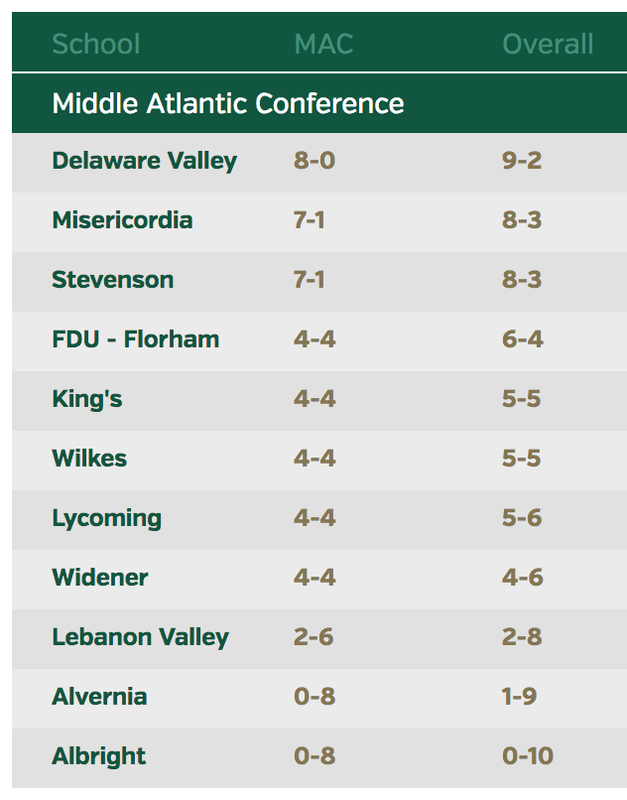 2 seed (Ursinus at Misericordia) game this year.